How Good Was 3-Time Olympic Gold Medalist Teofilio Stevenson? After winning his second Olympic Gold Medal in the heavyweight division the Cuban Teofilio Stevenson was rumored to have a bout with then world champion Muhammad Ali possibly in Havana for millions after the 1976 Olympics. His refusal statement was “what is five million dollars compared to the love of five million Cubans?” Fidel Castro was a big sports fan in baseball and boxing and it would not be a professional bout but an exhibition with monies going to the Cuban National boxing team. Stevenson at 6:05 got off to a bad start in 1966 losing his one fight in October to fellow Cuban Luis Henriquez. In 1968 he was 1-1 losing to Cuban Adolfo Galvez in November. In 1969 he was 0-1 losing to Cuban Gabriel Garcia in December. In 1970 at the age of 18 he went 9-1 reversing losses to Galvez and Garcia but losing to Bernd Anders of East Germany who had competed in the 1968 Olympics. In 1971 Stevenson defeated Galvez twice. In March in Cuba he lost to Czech Republic’s Petr Cemerys and again in that month in Praga, CZ. He was 9-2 before fighting in Cali, COL, in the Pan American Games. After defeating Pablo Sarmiento of ARG he lost to the USA’s Duane Bobick 3-2 and received a Bronze medal. He would win 7 of his next 8 bouts defeating Anders but losing to Yuri Nesterov of Russia. In 1972 Stevenson seemed to have come to age winning 11 straight including stopping Anders. He qualified for the Munich Olympics and defeated Ludwig Denderys of Poland and was re-matched with Bobick who had just won in a war over the favorite Nesterov. Why it wasn’t Stevenson who fought the favored Russian whom he lost to the previous year instead of Bobick was not clear. Russian and Cuba had a close relationship. After splitting the first 2 rounds Stevenson would stop Bobick in the third round. He would follow-up stopping Peter Hussing of West Germany with a counter right after Hussing landed a jab. “I have never been hit so hard in 212 fights,” said Hussing. Stevenson then defeated Ion Alexe of Romania for his first Gold medal in a walk over due to an injured hand. He was awarded the Val Barker trophy as the best boxer in the Olympics. In 1973 Stevenson was 9-1 defeating Cemerys by first round knockout. His only loss was to Igor Visotsky 3-2 of Russia. In 1974 he was 18-0 including a win over the USA’s Marvin Stinson who would be an alternate in 1976 to Olympian John Tate. In 1975 he had his 23 bout winning streak stopped by Galvez by walk over. He would win his next 14 bouts that year including the USA’s Michael Dokes who would later become a professional champion. This was for the Pan Am Games Gold in Mexico City, MEX. In 1976 Stevenson won his first seven fights before again losing to Visotsky by knockout in 3 in Belarus, Minsk. It makes one wonder if Stevenson was 0-2 against Visotsky then just how good the Russian would have been professionally? Stevenson would win his next four fights. At the 1976 Olympics in Montreal he stopped Mamadou Drame of Senegal in 2 rounds with a barrage of punches and Peka Roukkola of Finland in the 1. In the semi-finals he faced future professional champion John Tate in the first round. Tate suffered a bad cut along his left eye brow in his previous fight. In 1:30 of the first round a straight right hand followed a jab and Tate wobbled away and finally dropped in the corner and was counted out. Former world champ George Foreman was at ringside with Howard Cosell and said Stevenson would be a world champion as a professional no matter who he fought. In the championship round Stevenson stopped Mircea Simon of Romania landing a right hand that took Simon’s right foot out from under him and down in 3 rounds for his second Gold medal. In 1977 Stevenson would go 12-0 including stopping USA’s Woody Clark. In 1978 he won 25 straight before defeating USA’s Jimmy Clark 2-1 in Cuba in a close fight. He was 21-0 that year with 8 knockouts. In 1978 he was 21-0 with 15 by knockout including a win over future world champion Tony Tubbs in Belgrado, Yugoslavia, at the World Championships. In his last fight of the year he defeated Jimmy Clark by stopping him in the first round in New York. Jimmy claim’s “they stopped it with 30 seconds to go” which meant the 3rd round. In 1979 Stevenson was 17-0 including stopping USA’s Phillip Brown and Rufus Hadley both in the first round. Hadley was in the Pan Am Games in San Juan, Puerto Rico. In the final he defeated Marciso Maldonado of PR for the Gold medal. In 1980 he defeated Jimmy Clark in their third meeting. He had won 68 straight when he lost to fellow Cuban Angel Milian by walk over in June. The following month he was in his third Olympics defeating Solomon Ataga from NIG with a straight right hand in the first round. Ataga beat the count but was in no condition to continue. Stevenson then stopped the POL, and decisioned the HUN 5-0 before defeating Pyotr Zayev of Russia for his third Gold Medal. Though the score was 4-1, he dominated the much shorter Zayev with his jab the entire fight. 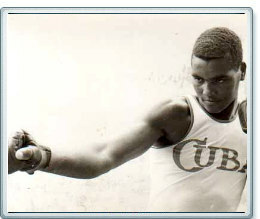 In 1981 Stevenson won all his 4 bouts and all in Cuba including beating Jorge Luis Gonzalez, a future professional from Cuba. In 1982 Stevenson was 10-2 losing to Ulli Kaden of East Germany by disqualification in East Germany. He also lost later in the year to Italy’s Francesco Damiani a future world champion, in Munich. In his last fight of that year he stopped USA’s Tyrell Biggs in the third round. Biggs would take the 1984 Gold since Cuba would not participate. In 1983 it seemed Stevenson was losing his dominance losing 4 out of 6 fights. He lost to Gonzalez and Kaden along with Aleksandr Lukstin of Russia and USA’s Craig Payne. In his last bout of the year he stopped Biggs in 3. In 1984 things seemed to pick-up as Stevenson went 12-0. He defeated Biggs by decision and Kaden 3 times, with the last 2 by knockout. “Stevenson hurt my ribs in beating me in our first match but I thought I won our last match in 1984,” said Tyrell Biggs. It was a close fight with Biggs getting rocked at the end when a right from Stevenson spun him around. In Stevenson’s final year of boxing in 1985 he was 16-4. He started the year off losing to Felix Lemus of Cuba and Vyacheslav Jakovlev of Russia. He would defeat both in rematches that year. He would be 2-1 against Kaden winning their series 6-3. He also had a loss to Osvaldo Castillo of Cuba before winning his last 4 bouts including a stoppage of USA’s Alex Garcia, a future professional in his last bout of his career in Reno, NV, for the World Championships. Overall Stevenson’s final record was 302-22. Not only was he 3-time Olympic champion but 2-time Pan Am Game’s champion and 3-times World champion. He defeated future world champions Michael Dokes, John Tate, Tony Tubbs and lost to Francesco Damiani. There is no doubt Stevenson would have been a top contender and depending who was champion at the time possibly a world champion in the professional ranks. He stuck to his guns and stayed in Cuba giving up millions. Stevenson will be 60 in March of 2012. Though doubtful he would have defeated Ali, Stevenson will go down as one of the all-time great amateur boxers! . NEW: Follow Doghouse Boxing on FaceBook!